Newton's first law of motion states that an object will remain at rest, or continue to move at a constant velocity, unless a net force acts on it. The term 'inertia' is s shorthand for 'the principle of inertia' as described by Newton in the full text of Newton's First Law of Motion which simply expressed means that an object that is not subject to any outside forces will move at a constant velocity, covering equal distances in equal times along a straight-line path - it will remain in its state of inertia. 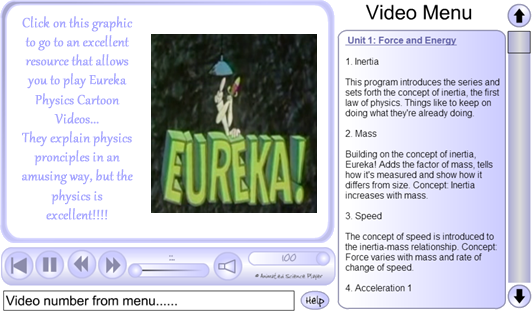 You need to look at video number 1 for 'inertia'. Replace the 'Video number from menu......' with '1' and press 'enter or return'. On the surface of the Earth the nature of inertia is often masked by the effects of friction wich makes people (among them a lot of physics students!) believe (as Aristotle did) that if something is moving there must be a force acting - regardless of whether that movement was constant or not! You need to understand that an object that is stationary or moving at a constant velocity has no net force acting on it - no acceleration - no force. See terminal velocity and friction. Newton's first law of motion tells us that an object at rest will stay at rest, while an object in motion will stay in motion, unless acted upon by an unbalanced force. An easy way to demonstrate this is in the car. When the car accelerates, you (and all other objects in the car) appear to be pushed backwards because the car is moving faster than you were as a resting object. Your inertia becomes apparent. A sudden deceleration makes you fly forward in your seat, because your body was traveling at a particular speed and inertia makes it want to keep going at that rate. This is why seat belts are important. In the video below 'Smarter Every Day' host Destin explores these ideas in his minivan (accompanied by two adorable and incredibly polite little science helpers), first by using a pendulum bob, then by using a helium balloon. The pendulum bob acts just as we would predict, swinging back when the van accelerates and forward when it decelerates. The helium balloon, however, doesn't act like Newton said it would at all. That's because in the case of the lighter-than-air helium balloon, simple Newtonian physics are out and fluid dynamics are in. We have to consider the behaviour of the mass of air within the car... which is denser than the helium and therefore has more inertia than the helium... check out the video.